(by Julia A. Seymour, Feb. 6 at MRC Business) – While the early February 2018 market [drop] has spooked some investors and already gained plenty of media attention, it illustrated all too well the broadcast networks’ tendency to cover bad economic news more than good. The networks skipped the vast majority of records as the market climbed throughout 2017 and the beginning of 2018. The single-day drop of about 666 points (or 2.5 percent) on Feb. 2, got more time from the broadcast network evening news programs than their combined coverage of the Dow 25K and Dow 26K milestones right before it. A bigger decline on Feb. 5, left NBC Nightly News freaking out, although CBS Evening News tried to quell panic. Ahead of the recent selloffs, the stock market had been on a tear, especially since the election of Donald Trump. MarketWatch reported that the 1-year Dow gain from Election Day was more than 28 percent, and the biggest gain in more than 70 years for that time period. From Election Day to the record close above 26,000 on Jan. 17, 2018, the Dow had increased in value by almost 42 percent. Seventy-one of those closing records took place in 2017, according to Marketwatch.com. The Dow notched 11 more in 2018, before the recent pullbacks. Standalone on screen graphics without any spoken words from an anchor or reporter were not counted because they were so easily missed and lacked context. Early in the stock market rally, it quickly became nicknamed a “Trump rally.” Even liberal media like Vox admitted the rise was connected to hope regarding potential Trump economic policies like corporate tax cuts. Later on, other factors including corporate earnings, stronger global economic growth rates and the promise (and passage) of tax reform continued pushing the Dow upward. Viewers couldn’t even count on all three networks covering “milestone” record highs (the first time a close was above 23K, 24K, etc). Often only only one or two of the three news programs would cover those records. For example, the very first time the Dow closed above 23,000 was Oct. 28, 2017, and only one of the three evening newscasts covered it. Nightly News gave a sparse 11 seconds to “another record day on Wall Street.” World News Tonight with David Muir and Evening News didn’t say a word about it that night. The first close above 24K — 24,272 — got a bit of coverage from World News and Nightly News on Nov. 30, 2017. Together those shows spent 25 seconds on that record high close and ABC noted it was driven by “optimism” about the tax bill. Evening News said nothing again that night, only showing a graphic. Evening News did cover the two non-milestone records that immediately followed the 24K close (24,290.05 on Dec. 4, 2017 and 24,329.16 on Dec. 8, 2017) when “Wall Street” was celebrating tax cuts, and when a good jobs report gave stocks a “boost.” But the other programs skipped those. In 2018, the Dow closed above 25,000 on Jan. 4, and finally all three programs covered the story at least a little. World News gave it 11 seconds, Evening News 84 seconds and Nightly News 67 seconds. But the Jan. 17, 2018, close above 26,000 got no mention on Nightly News and just 13 seconds on the other two broadcasts. Nightly News did find time to cover a new dieting trend that night. Often the records were piled high before a broadcast would report on it again. World News ignored 30 record highs in a row, from Aug. 3, 2017, through Jan. 3, 2018. The Dow records on those dates started with 22,092.81 and ended at 24,922.68 — more than an 12.8 percent gain. It wasn’t until Jan. 4, 2018, World News finally reported another record, after the Dow closed above 25K for the first time. Evening News was silent about many of those same records, failing to talk about 23 closing records in a row from Sept. 20, 2017, through Nov. 30, 2017. The Dow climbed 1,859 points during that period. The program often showed an onscreen graphic of the Dow closing number, sometimes with a small “record high” written next to it — but those were not counted as stories or news briefs. Nightly News also ignored records for a long stretch, censoring 17 in a row from Aug. 3, 2017, through Oct. 16, 2017. 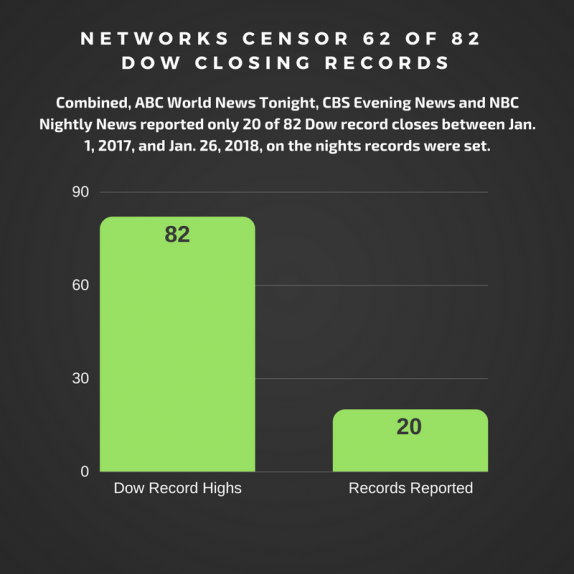 MRC Business utilized Nexis and MRC archives to see if there were stories or news briefs about the stock market on ABC World News Tonight with David Muir, CBS Evening News and NBC Nightly News on the 82 nights of Dow Jones Industrial Average closing record highs between Jan. 1, 2017, and Jan. 26, 2018. Onscreen graphics of the closing Dow number with or without “record close” written beside the number were not counted because they were easily missed without a reporter or anchor saying anything about them. They also often flashed on screen right before or after a commercial break. Aly Nielsen assisted with the research of this project. 1. What type of bias does this article illustrate? 2. Do you think the media purposely ignored the historic rise in the stock market under President Trump? Explain your answer. 1. Bias by omission, story selection and spin.